After many years as a symphony violinist, Gary branched out to form his own ensemble of musicians to perform live at a variety of social and business events. Within a short time he decided to not only play, but also record with the musicians he most enjoyed – all world class performers. Now a producer, performer and recording artist of multiple CDs, Gary has created his own style, which is a synthesis of classical, swing, jazz, and romantic pop music. He arranges full instrumental pieces with strings, piano, guitar, French horns, oboe, and of course, his own solo violin work. His recordings with ensembles are instrumentals of classic and popular, often sentimental melodies. Most have been recorded live in the studio resulting in an engaging, lush sound of concert hall quality. Each performance, whether a romantic wedding song, a holiday classic or a contemporary favorite is crisp and perfected. 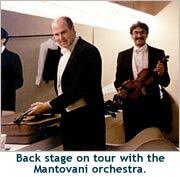 Gary has been Concertmaster (first chair violinist) with the internationally acclaimed Mantovani Orchestra, and a titled member of the Rochester Philharmonic Orchestra in New York. In his native Dallas area, he was Concertmaster of the Richardson Symphony, and also a member of the Fort Worth Symphony and the Dallas Chamber Orchestra. Gary has also performed in back up orchestras for such celebrated singers as Andrea Bocelli, Sarah Brightman, Tony Bennett, Perry Como, Roberta Flack, Chuck Mangione, Toni Tennille, and others. He was trained as a classical musician, holds a Master’s degree from Yale School of Music, and has spent most of his professional life as a classical violinist and symphony player.